It has been 5 years and it seems like yesterday when we were preparing the equipment to ascend the roof of Africa, the summit of Kilimanjaro was waiting for us, although well, the trip of exploration to Tanzania involved several adventures: the ascent, a safari by the Gnorongoro, Serengueti and Taranguire and for those who had more days available, take two light aircraft and practice diving in Zanzibar. As every trip starts with the corresponding commute, I mention our combination of flights (part of the team flew from Switzerland, Granada and Palma de Mallorca). Walking through the Kilimanjaro National Park means being surrounded by a forest reserve of almost 900km², the volcano still active, formed by three volcanoes, was first scaled by the German Hans Meyer and the Austrian Ludwig Purtscheller in 1889 and is considered one of the Seven Summits. The ascent starts in a tropical forest where colobus monkeys observe every step you take and end with glaciers (although they are almost extinct), with which the equipment, landscape and weather conditions vary considerably from the first to the last day. 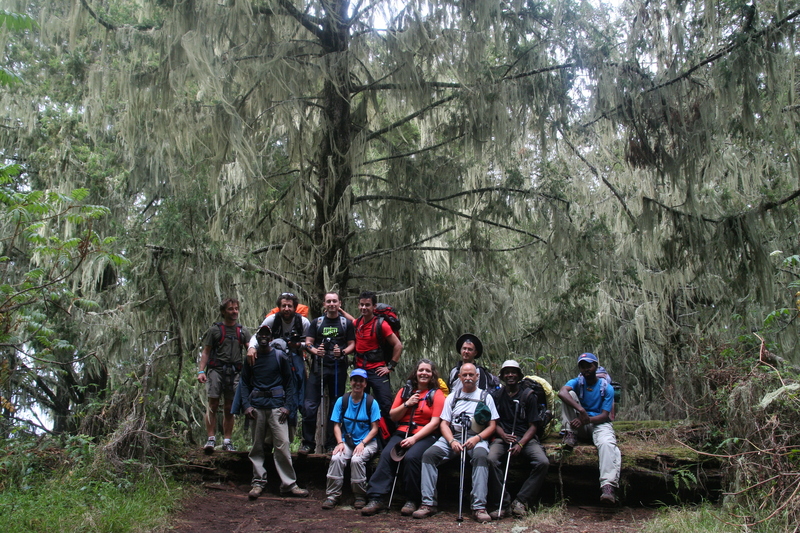 If you want to climb Kilimanjaro, there are seven alternatives, Machame and Marangu being the two most known and apparently more crowded, to avoid such situation and look for a wilder route we chose Lemosho. The crossing consists of 6 nights for the ascent and one night on the descent. This means that none of the team had acclimatization problems. Not to mention! Some agencies offer it in 4 days. Obviously, it is feasible, but the pace does not allow you to enjoy the landscape and many are not reaching the summit because of altitude sickness, we are talking about “almost” six thousand!! In a team of 9 participants like ours, it takes two jeeps to start the route, twice the porters, two guides, one cook and two kitchen helpers. Every night we sleep in two-in-two tents, and there is the main tent where the team has breakfast, dinner and daily meetings. There are bathrooms (wooden houses) special for the customer and others for the Tanzanian team, for my part is better the forest bath, obviously without leaving rolls of paper everywhere. The day that our route merged with the road Machame and we spent the night at the Barranco camp (3950 m) we realized that the peace of walking alone was over. It is true that each group has a different rhythm but in Karanga camp (4000 m), and Barafu (4600 m) is remarkable the increase of mountaineers. On the day of the summit, we started the route at 00.00. I think it has been one of the most spectacular skies I have ever seen. The sunrise surprised us less than an hour from the summit, and the warmth of the sun was a gift from nature. The faces of joy on the mountain, the hugs, the words of affection and the atmosphere of peace that was breathed will always be engraved in my memory. Información muy útil!!. Aunque tengo un poquito de envidia sana. Qué conste! Verdaderamente Africa me parece un País con magia. Que ganas de viajar a Tanzania, y rodearse de su mágica naturaleza, y como no de surfear un poco sus costas. Que interesante, siempre he querido conocer Africa, pero no he tenido la oportunidad… Ya que regresas en octubre estaré esperando que nueva información publicas en el blog! Sí María, África tiene una magia especial. ¡Algún día tienes que ir!